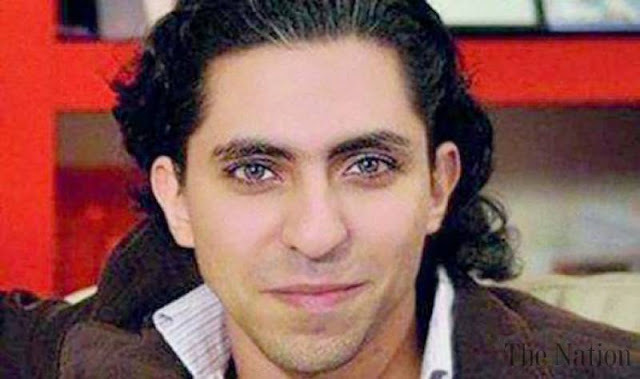 Raif Badawi, a blogger and activist who has been imprisoned and publicly flogged for criticizing Saudi Arabia’s religious establishment, was awarded the Sakharov Prize for Freedom of Thought, the European Union’s top human rights award, on Thursday. On Jan. 9, Mr. Badawi received his first 50 lashes at a mosque outside the port city of Jidda. It is not clear why he has not been caned since then, though his wife, Ensaf Haidar, has said that he is in poor health and might not survive the caning. Ms. Haidar and the couple’s three children live in Canada, where they sought asylum. The authorities also jailed Mr. Badawi’s lawyer, Waleed Abulkhair, the founder of a group called Monitor of Human Rights in Saudi Arabia. He was sentenced last year to 15 years in prison for undermining the government, inciting public opinion and insulting the judiciary. Reached by telephone, an official at the Saudi Mission to the European Union in Brussels said the kingdom did not have a response to the announcement. He pointed to a past statement in which the Saudi authorities stated that their judicial system was independent and that it was not the place of outsiders to criticize it. UN Human rights conference was also headed by Saudi Arab but seeing many examples of unfair punishments on free speech, many criticized this act.